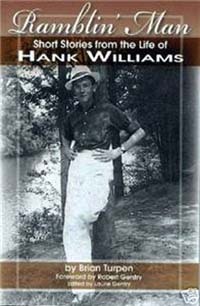 A brand new book is now available on Hank Williams. The book is nearly 200 pages long, filled with many related photographs. It is very well put together along with a glossy front and back covers. The foreword is written by Robert Gentry. The book contains many short stories, most about previously unknown topics relating to Hank. There are a total of 51 separate stories. For example, included are stories about: Hank�s brother Ernest Huble Williams who died as an infant; Hank�s first home; the lady who helped deliver Hank; a lenghty 32-page article on the 1949 Grand Ole Opry Eurpoean Tour (co-written with Manfred Reinhard); his 1951 Montgomery Homecoming, his 1952 Greenville Homecoming, his Nashville farm; several stories concerning Hank�s songs; and many others. It is a must for every Hank fan and collector. If requested, the author will sign any book ordered through him.